“Survival is the celebration of choosing life over death. We know we’re going to die. We all die. Why do some people survive and others perish after experiencing the same set of circumstances? Why do some people walk out of a jungle after a plane crash and others sit and die? Author Laurence Gonzales digs deep into these questions and provides lessons in Deep Survival: Who Lives, Who Dies and Why. He looks at specific cases to examine scientifically some reasons people tend to survive. His motivation stems from his father’s own survival of both a military plane crash and being a prisoner of war. Maybe survivalism can be passed down through the genes. I came across Deep Survival: Who Lives, Who Dies and Why when a friend recommended it to me. I needed to paint our newly refinished basement and needed an audiobook to listen to while completing the task. It was available through my library’s Libby app, so I downloaded it and got down to painting. The book held my attention the entire time. After listening to his father’s WWII survival stories, Gonzales began taking his own big risks to see what he could survive in the nearby bayou in Texas. He started writing about his adventures and became a journalist. 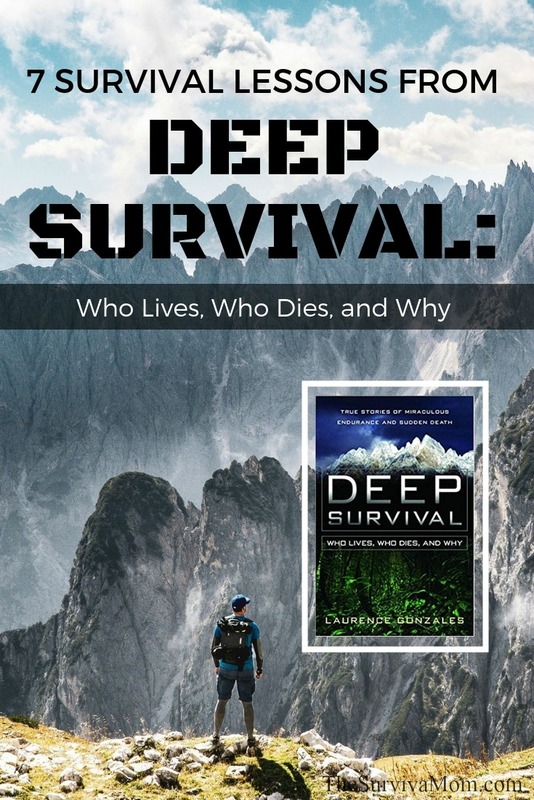 Deep Survival: Who Lives, Who Dies and Why is almost 300 pages and is divided into two sections – “How Accidents Happen” and “Survival”. Each section is full of real-life stories to give examples and tips for survival. 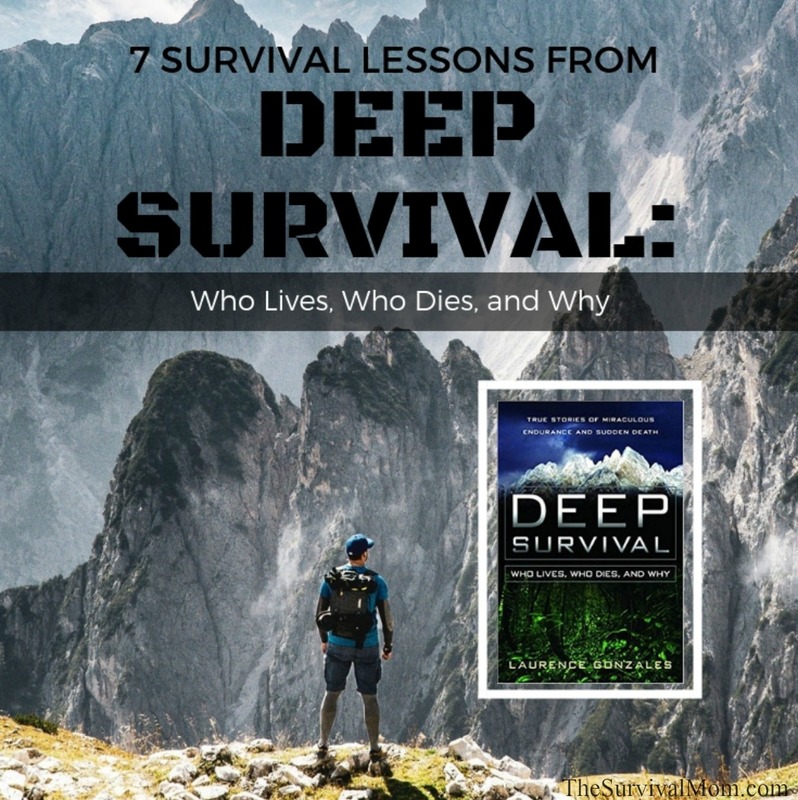 I’ll share a few lessons from Deep Survival. When you read the book, I’m sure you will find many more. Being a pilot is a job that is inherently risky. Fighter pilots take off and land on aircraft carriers, which might be the riskiest job of any pilot. They take off with the help of an explosion and when landing, try to hook a wire at 150 mph. To learn how fighter pilots deal with stress, Gonzales went on an aircraft carrier and watched the pilots take off and land. He talked with them about how they dealt with being a fighter pilot. One of the keys to pilots facing danger is that they accept that things can go south – they accept the danger and truly know the risk they are taking. Then, they are able to find humor in the fear. It’s good if they have some fear, but not if they are too afraid. Things are given nicknames to lighten the severity in the mind, even while the actual severity is known. Pilots also have to be aware of knowing what they don’t know and having a secondary memory to rely on. Any number of things can be distracting, but muscle memory and rote memorization can help information come back to the surface. Fighter pilots accept reality and deal with it by using humor and knowing how to rely on experience over emotion – something survivors need to be able to do. One strategy to work through fear is to learn “survival breathing” as detailed here. If you’ve taken a risk and survived, even something as simple as crossing a busy road, you have developed a healthy emotion attached to that risky activity. This can affect your decision when you come to another related risky activity. A snowmobiler warned of avalanche conditions may still go up a hill because they have gone up before and survived – and it was fun. The emotional bookmark in the brain can override the logic and facts of a situation. A scientific experiment was held with a woman who had no short-term memory. She shook the hand of her doctor and he had a tack in his hand that pricked her. From that day on, she was hesitant to shake his hand even though she had no memory of the event. Her body remembered the emotion of pain, though. Being aware of this can help you realize when you are basing a decision on an emotional bookmark and not on the facts. Learn more about how your brain can work either against your survival or for it in this article. Accidents are normal, even if rare sometimes. In any system, there are points of collapse. This is best shown in making a pile of sand by letting sand dribble on a surface, like in an hourglass. It will collapse as more sand is added, sometimes big, but most often small. So, on a mountain, there will be climbing accidents, sometimes big, but most often small. Accidents will happen anywhere and everywhere, so we should always be prepared for them to happen. It is good to know, too, that the bigger accidents are less likely to happen than the smaller ones. From an everyday survival perspective, it is almost a sure thing that everyone will experience a power outage. Most will experience outages that last a few hours or less. Few will experience the ones that last days upon days. We can take into consideration some drastic scenario like an EMP (read more here on that topic), but in all reality, most everyone will only experience occasional blips. For anyone going anywhere, one of the keys to survival is knowing where you are going. Many people have perished going hiking on a trail without a map or by visiting a location unprepared with the right gear for the location. One example cited in Deep Survival takes place in Hawaii. One of the most famous examples of this is people who go missing in Hawaii after setting out to go on a 1-2 hour hike by themselves. The trees hide cliff edges and the tide can carry a body away to a place where it will never be found. To have a good chance of survival, you have to know where you’re going and be prepared to deal specifically with that situation. One of the most simple and important survival tips is to look back when you are moving. Hiking on a trail could be thought of as simple, but on the return trip, you’ll be making decisions about which direction to take. If you’ve been checking the trail behind you, you’ll have a better memory of that spot when you are coming from the opposite direction. By looking back and seeing what the trail will look like on your return, you can have a better chance of making your way back home. One wilderness survival school instructor has his students stop every 20-30 minutes and look intently at some part of the trail or discuss something intently at that part of the trail. Students are then able to find their way back by remembering these specific places. The instructor teaches many other skills, such as compass use and building fires and those skills are key, too. However, many of us don’t have the time to take an in-depth survival course. We need to learn one skill at a time. In some stories, it seems that some people just give up in hard situations. The difference between them and survivors seems to be the mental attitude. Someone who is trapped in an ice cave can either be sure he is going to die and become completely depressed, unable to focus on a way out or, instead, look around and see how beautiful it is in this horrible situation. Many survivors recall being able to get their mind outside of their situation by looking at the beauty of their surroundings. Many who survived days afloat in the ocean saw the beauty of the sunrises, sunsets and stars, all while fearing sharks, getting sunburned and dying of thirst. This alone seems to be the factor that kept them from jumping into the ocean. If the environment doesn’t lend itself to beauty, some survivors turn to memories or mind games as a place to escape for a while so they can then face the reality of where they are and what they must do to survive. Your attitude in a situation can be the difference between life and death. Once a person has survived a catastrophic event, he or she has to deal with what comes after that – living. Surviving also means living with what happened to you and possibly to people you knew and loved. In many situations, not everyone survives, so those who do must grieve but then may wonder why they are alive and others aren’t. In the end, Gonzales returns to his father and comments on the decades his father lived after surviving the plane crash and being a POW. The memories, guilt, scars, and pain were carried with him, along with the lessons. Those who survive have looked death in the face and know how precious life is. Some may have trouble coping with it, but others thrive. Maybe the ultimate survivors are those who then go on to live well. Why do you think some people survive while others don’t? Share your thoughts! * Some of the survival situations are from Sept. 11, 2001, so if that event affected you personally, I wanted you to be aware of that fact. I own and have read this book 5 or 6 times. It is one of the most outstanding books I’ve ever read about surviving and it puts into words all of the things that one really goes through in a tough situation. I’m not into flattery of blowing smoke. The writer is an atheist, I’m guessing, but beside that the book is an absolute read and buy to keep on your shelf. Surviving can sometimes not achieved for some. We have to be reminded that it means accepting with what happened to you and probably to the people you knew and you loved. What really matter is that be able to live after a catastrophe.